Again, these are just estimates based on the equivalent of scraping Groupon’s site, and thus could be missing something. Well, at least for February, it looks like those numbers are way off. The post obviously caused some ripple effects to the extent that Groupon had to start addressing the issue with potential hires. As a result, it knocked loose the real revenue numbers for February and January. 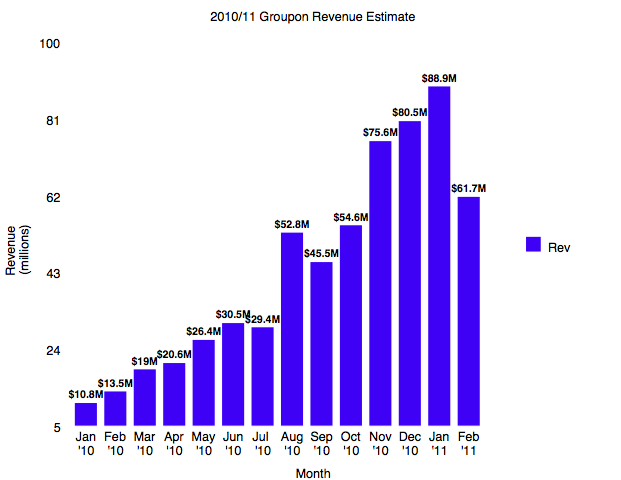 Groupon wouldn’t comment on the revenue numbers when I asked them about it, but according to a source, Groupon is now privately countering the numbers in my post: instead of $62 million in U.S. revenues, the company did $103 million in February. And that is up from $92 million in January (compared to the $89 million in the original data below). I did some checking around, and I’ve been able to confirm that these two numbers (the $103 million and the $92 million) are right. I was also able to confirm that the 60/40 mix between U.S. and international revenues is about right. But getting back to the cause of the drop. My original source on the data cautioned that there is a lag time between when the data is published and collected, and it is “definitely possible” that could account for the drop in February. Note that both January numbers are pretty close. The real discrepancy is with February. 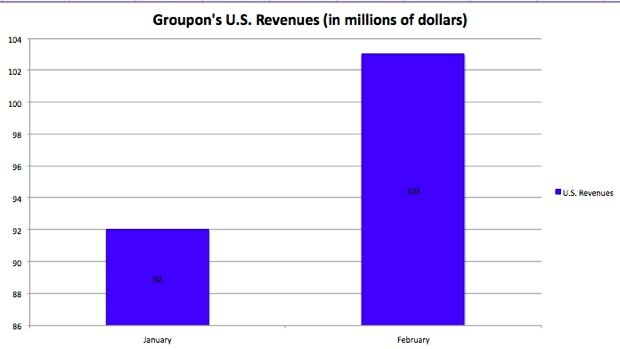 Also, if Groupon changed the way it published the pages in February, that too could have changed the numbers. Other external guesstimates such as Yipit’s also point to a drop, but again, the more I learn about how this data is collected, the clearer it is that these are all imperfect methods. Groupon, of course, brings this speculation upon itself by being so tightlipped about its financials. That will change only if and when it files for an IPO.